Grandmaster Joe Olivarez is our head instructor. He has been continuously involved in the martial arts for over 45 years. He received his Grandmaster ranking from Grandmaster Charles H. Gaylord. Grandmaster Olivarez was a street fighter who began his training as an amateur boxer in Mexico prior to his involvement with martial arts. In 1976, he received his 1st degree black belt from Master Robert J. Gaylord. Grandmaster Olivarez was a professional bodyguard and has been in charge of many security programs for several types of facility events. He now teaches martial arts and boxing on a full-time basis. The Olivarez Style combines: Chinese Kenpo Karate for a firm foundation. Shaolin Gung-Fu for its swift and flowing movements. Western Boxing for its head and body weaving; and footwork patterns. Corto Cadena Escrima for its very evasive and innovative techniques. Jujitsu for its effective joint manipulation techniques. U.S. Karate School of the Arts and Boxing Gym is the most diversified martial arts training center in the area. We are pleased to offer group, private, and semi-private classes in a friendly family environment. 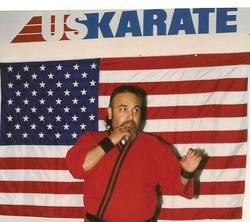 U.S. Karate is associated with the Kajukenbo Association of America. Call us at (510) 317-8825 or have use call you.